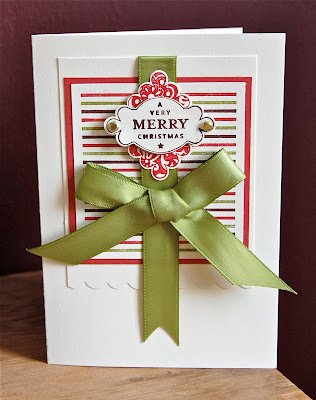 Here's a classic Christmas card I made using Punches Three and the oh-so-useful Solid Stripes background stamp. The tag is ornate enough to be focal point of the card, emphasised by the large satin bow. Cut a piece of Very Vanilla card stock 7.5cm wide x 8cm high. Take the Solid Stripes background stamp and colour it directly with markers. Huff on the stamp and press onto the card stock. Mount this panel onto a piece of Real Red card stock cut 8cm wide x 8.5cm high. Cut a piece of Very Vanilla card stock 8.5cm wide and 12cm high. Scallop the bottom with the scallop border punch. Mount the striped panel onto this. Stamp the tag twice on a spare piece of Very Vanilla card stock, once in Chocolate Chip and once in Real Red. Cut both out with the scallop square punch. Snip the pattern off the Chocolate Chip image leaving the ornate tag shape. Pierce a hole in the sides of this one, using the stamped star as a guide, and add a gold brad to each side, bending the pins back so they're not visible. Using dimensionals, attach the Real Red square to the striped panel on top of the ribbon. Add the ornate tag to the top of this using more dimensionals. Adhere the panel to a Very Vanilla card base and finish with a large bow attached with Sticky Strip. So I spent the weekend making samples for my catalogue launch party on Thursday evening and using all the new colours with some of the new stamps and designer papers. Here's something I've learned this weekend: never under-estimate the fun value of new colours! I had a ball! That Punches Three is so interesting. I checked both the holiday mini and the regular catty (US versions of course) and don't see that set. I guess we weren't lucky enough to get that one here. I really like how you colored each individual stripe. Makes such a great background. And what a fantastic bow. Hi Vicky ... love your card using Punches Three. You'll never guess what I did? Instead of asking for Punches Three, I inadvertently ordered the Stempel Trio (German version)! You'd think I'd know the difference, especially as I can speak German. Now I'm waiting for my replacement so of course I'm frustrated I can't make any cards using this stamp yet!!! PS: What a lovely idea with the ribbon! Gorgeous.